err = cvshrink(obj) returns a vector of cross-validated classification error values for differing values of the regularization parameter Gamma. [err,gamma] = cvshrink(obj) also returns the vector of Gamma values. [err,gamma,delta] = cvshrink(obj) also returns the vector of Delta values. [err,gamma,delta,numpred] = cvshrink(obj) returns the vector of number of nonzero predictors for each setting of the parameters Gamma and Delta. [err,...] = cvshrink(obj,Name,Value) cross validates with additional options specified by one or more Name,Value pair arguments. Discriminant analysis classifier, produced using fitcdiscr. Scalar delta — cvshrink uses this value of delta with every value of gamma for regularization. Row vector delta — For each i and j, cvshrink uses delta(j) with gamma(i) for regularization. Matrix delta — The number of rows of delta must equal the number of elements in gamma. For each i and j, cvshrink uses delta(i,j) with gamma(i) for regularization. Vector of Gamma values for cross-validation. Number of Delta intervals for cross-validation. For every value of Gamma, cvshrink cross-validates the discriminant using NumDelta + 1 values of Delta, uniformly spaced from zero to the maximal Delta at which all predictors are eliminated for this value of Gamma. If you set delta, cvshrink ignores NumDelta. Number of Gamma intervals for cross-validation. cvshrink cross-validates the discriminant using NumGamma + 1 values of Gamma, uniformly spaced from MinGamma to 1. If you set gamma, cvshrink ignores NumGamma. Verbosity level, an integer from 0 to 2. Higher values give more progress messages. Numeric vector or matrix of errors. err is the misclassification error rate, meaning the average fraction of misclassified data over all folds. If delta is a scalar (default), err(i) is the misclassification error rate for obj regularized with gamma(i). If delta is a vector, err(i,j) is the misclassification error rate for obj regularized with gamma(i) and delta(j). If delta is a matrix, err(i,j) is the misclassification error rate for obj regularized with gamma(i) and delta(i,j). Vector of Gamma values used for regularization. See Gamma and Delta. Vector or matrix of Delta values used for regularization. See Gamma and Delta. If you give a scalar for the delta name-value pair, the output delta is a row vector the same size as gamma, with entries equal to the input scalar. If you give a row vector for the delta name-value pair, the output delta is a matrix with the same number of columns as the row vector, and with the number of rows equal to the number of elements of gamma. The output delta(i,j) is equal to the input delta(j). If you give a matrix for the delta name-value pair, the output delta is the same as the input matrix. The number of rows of delta must equal the number of elements in gamma. Numeric vector or matrix containing the number of predictors in the model at various regularizations. numpred has the same size as err. If delta is a scalar (default), numpred(i) is the number of predictors for obj regularized with gamma(i) and delta. If delta is a vector, numpred(i,j) is the number of predictors for obj regularized with gamma(i) and delta(j). If delta is a matrix, numpred(i,j) is the number of predictors for obj regularized with gamma(i) and delta(i,j). Regularize a discriminant analysis classifier, and view the tradeoff between the number of predictors in the model and the classification accuracy. 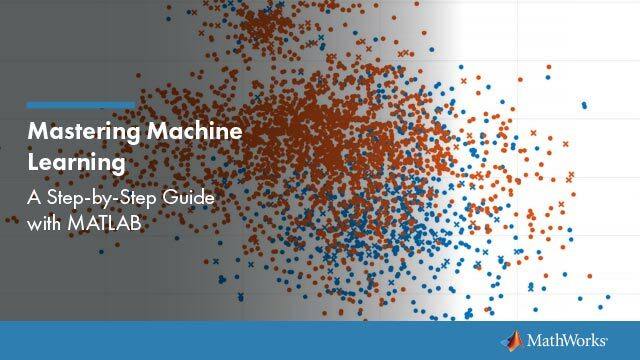 Create a linear discriminant analysis classifier for the ovariancancer data. Set the SaveMemory and FillCoeffs options to keep the resulting model reasonably small. Use 10 levels of Gamma and 10 levels of Delta to search for good parameters. This search is time-consuming. Set Verbose to 1 to view the progress. Processing Gamma step 1 out of 10. Processing Gamma step 2 out of 10. Processing Gamma step 3 out of 10. Processing Gamma step 4 out of 10. Processing Gamma step 5 out of 10. Processing Gamma step 6 out of 10. Processing Gamma step 7 out of 10. Processing Gamma step 8 out of 10. Processing Gamma step 9 out of 10. Processing Gamma step 10 out of 10. 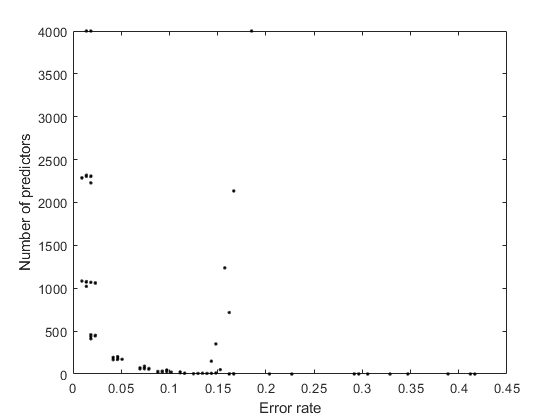 Plot the classification error rate against the number of predictors. Regularization is the process of finding a small set of predictors that yield an effective predictive model. For linear discriminant analysis, there are two parameters, γ and δ, that control regularization as follows. cvshrink helps you select appropriate values of the parameters. Whenever γ ≥ MinGamma, Σ˜ is nonsingular. The parameter δ enters into this equation as a threshold on the final term in square brackets. Each component of the vector [C˜−1D−1/2(μk−μ0)] is set to zero if it is smaller in magnitude than the threshold δ. Therefore, for class k, if component j is thresholded to zero, component j of x does not enter into the evaluation of the posterior probability. Therefore, when δ ≥ DeltaPredictor(i), the regularized classifier does not use predictor i.